Feel like royalty as you walk over a beautiful, handcarved stone bridge! 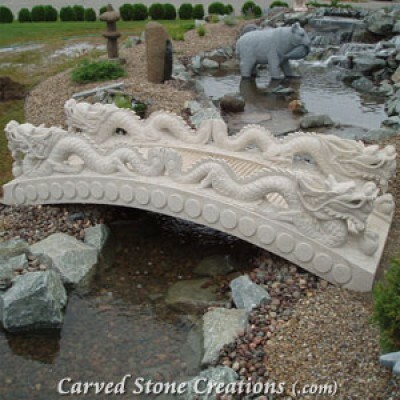 The oriental dragon bridge (left) carved from Giallo Fantasia granite is one design idea for your garden. It has two carved Chinese Dragons that are truly jaw-dropping. Embark on a tropical journey as you walk over a bamboo bridge handcarved from a single block charcoal grey granite. This bridge has polished bamboo rails and is truly one of a kind. Handcarved stone planters are a wonderful way to showcase the flowers in your garden! The carved granite planter (left), is carved from Giallo Fantasia Y granite and has beautiful and intricate designs. 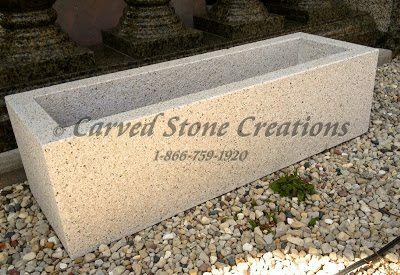 A contemporary style planter option is the granite trough planter, made from Giallo Fantasia granite. This sleek, rectangular planter is incredibly durable. Stone gazebos are an elegant focal point for your garden. Whether you want to relax during a sunny day or simply enjoy the outdoors, a stone gazebo is a wonderful place to partake in these activities. Not only are they practical, but they are also visually appealing. The Corinthian-style twist gazebo, handcarved from Giallo Fantasia granite, includes six columns with a twisted fluting design. It has beautiful floral elements and built in benches, giving you the perfect place to relax and take in the beauty of your garden. 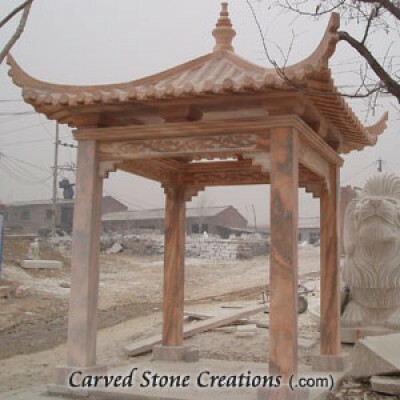 Add oriental flair to your home with a carved marble Japanese style gazebo (right). These two different designs show the gazebo design possibilities are endless and your imagination can run wild! 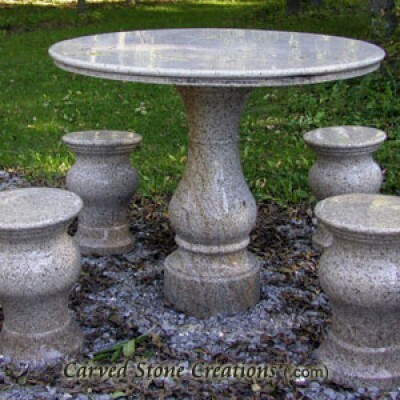 If you want to enjoy an outdoor picnic, a stone table is the perfect addition for your garden! The durable stone cools you down when you sit, and beauty surrounds you at every corner. The polished round table with matching stools are handcarved from natural stone and have many colors that catch they eye. 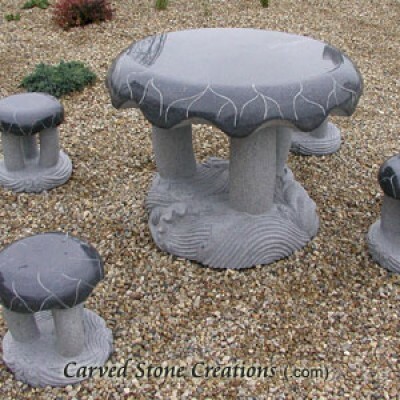 The whimsical mushroom table is handcarved from charcoal gray granite. Both creations are different, but very practical and beautiful. 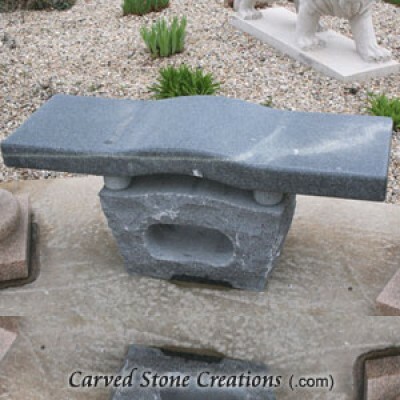 Handcarved stone benches add a unique touch to your landscape as you soak up the beauty of your garden! 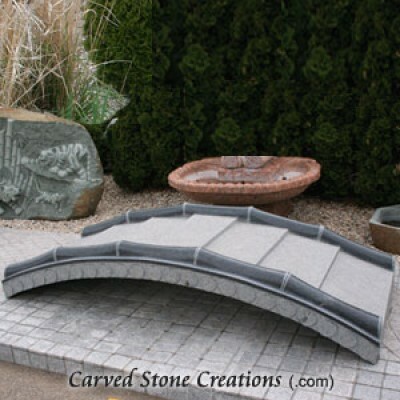 Stone benches come in different designs and colors, making each one truly one of a kind. The rockface curved garden bench (left) is created from Giallo Fantasia granite and has a rustic feel due to the rough, natural finish. If you want a completely different style, the contour bench with a ball-block face is handcarved from charcoal gray granite. It is a contemporary design with a unique shape. Are you interested in incorporating stone decor in your garden? Contact us today!